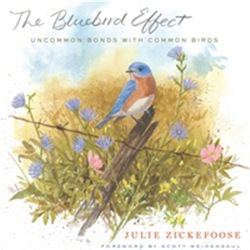 Julie Zickefoose lives for the moment when a wild, free living bird that she has raised or rehabilitated comes back to visit her; their eyes meet and they share a spark of understanding. Her reward for the grueling work of rescuing birds—such as feeding baby hummingbirds every twenty minutes all day long—is her empathy with them and the satisfaction of knowing the world is a birdier and more beautiful place. The Bluebird Effect is about the change that's set in motion by one single act, such as saving an injured bluebird—or a hummingbird, swift, or phoebe. Each of the twenty five chapters covers a different species, and many depict an individual bird, each with its own personality, habits, and quirks. And each chapter is illustrated with Zickefoose's stunning watercolor paintings and drawings. Not just individual tales about the trials and triumphs of raising birds, The Bluebird Effect mixes humor, natural history, and memoir to give readers an intimate story of a life lived among wild birds. Acquista The Bluebird Effect in Epub: dopo aver letto l’ebook The Bluebird Effect di Julie Zickefoose ti invitiamo a lasciarci una Recensione qui sotto: sarà utile agli utenti che non abbiano ancora letto questo libro e che vogliano avere delle opinioni altrui. L’opinione su di un libro è molto soggettiva e per questo leggere eventuali recensioni negative non ci dovrà frenare dall’acquisto, anzi dovrà spingerci ad acquistare il libro in fretta per poter dire la nostra ed eventualmente smentire quanto commentato da altri, contribuendo ad arricchire più possibile i commenti e dare sempre più spunti di confronto al pubblico online.